Third Time’s a Charm | Barbie Who? For the third doll, I am recreating an Ood. Surprised? So am I. I wanted to make Donna, but my white crochet thread is MIA and I refuse to buy a new spool. It’s just the principle of the matter. Instead, I decided to go with a cool alien from one of my favorite Donna adventures. The Ood are an alien race from Doctor Who. They are telepathic and have two brains – one in their head and one they carry in their hands (the hindbrain). Humans enslaved the Ood to do general house tasks in the 39th century; they did this by removing their hindbrain and replacing it with a translator sphere. For centuries humans believed that the Ood were docile and offered themselves into servitude, but in reality their temperment came from the removal of the hindbrain. This also disabled their telepathic abilities, which caused their normally white eyes to turn bright red. The humans believed that the resergence of red eyes was a disease, but the Doctor and Donna were able to uncover the sad truth about Ood enslavement. Thankfully, with the Doctor and Donna’s help, the Ood were returned to their home planet to live in freedom. The cool thing about the Ood is how they are a modern addition to Doctor Who. They made their debut during the reign of the Tenth Doctor and have popped up occasionally in other episodes since then. While many classify them as bad guys, I consider them more misunderstood. I feel like the humans were the bigger villains during their main episodes and the Ood were just standing up for themselves. My favorite Ood episode has to be Planet of the Ood. The episodes starts off with the Ood looking like the villians, but it turns out the corporation is the real monster because they lobotomize Ood before selling them as servants. It also has a particularly touching moment with Donna – she first thought that traveling with the Doctor would be nothing but fun and adventures, but she realized that bad people still existed and did terrible things on a terrible scale at all points in history. I think that this realization is something that most people go through at one point in their lives. In the end, the Doctor and Donna save the day. The Ood are freed and sent back home, the evil head of the corporation is turned into an Ood, and Donna decides to continue traveling with the Doctor. I haven’t decided what doll I am going to use for this Ood. I think that I will use one of the generic dolls I have around the house. I would hate to cover up the face and hair of a good Barbie doll, so I will go with one of the other dolls that I’ve picked up. One thrift store I frequent has the uncanny ability to package a nice doll with a generic one; it is brilliant on their part, but it has given me 4 or 5 dolls that are made from hollow plastic that I hadn’t planned on using for the blog. I will look at the prospective dolls and decide which one to use after I do some preliminary pattern scouting. Body shape does play a big part in making these clothes, so I will try to go with a doll with the body that best fits the pattern I want to use. 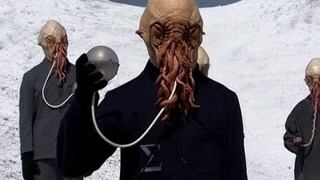 To create this Ood, I plan on modifying a human-sized crochet face mask I found on Pinterest. Sizing it down should be interesting; I just hope that I won’t have to start entirely from scratch when making it. It just depends on how well my smaller materials match the pattern. The Adipose sized down very well; the only change I made was in the arms and legs. Still, this a mask is quite the different fish from a plush. Luckily, I am fairly good at free-hand crocheting when needed. It should be interesting to see how it goes! In addition to the mask, I will also have to make the hindbrain and a black outfit for the Ood to wear. I am not sure what type of accessory I will make for my Ood just yet; I believe I will watch an episode or two of Doctor Who before deciding. This should be fun! I am hoping that it will go rather quickly since I am crocheting the mask. I haven’t decided if I want to knit or crochet the outfit yet. Hopefully I can knit it! I really want to test out my new set of 2.00 mm knitting needles. I plan on browsing the Sticka till Barbie website to see if anything strikes me as Ood-like; if not then I will probably crochet a pair of pants and modify the Pea Coat Pattern to fit an Ood. That being said, it will likely be a while before I make my final decision on the outfit. Right now, I am focusing on choosing a doll and making the mask. Until next time, cheers! It will be interesting watching your transform a doll into an Ood. This sounds like quite the challenge – I’m looking forward to seeing how you do this. Have fun! Thank you! We’ll see how it pans out. I was scouting some patterns this afternoon and I found a few I like, so hopefully it all will go smoothly. An Ood! That is going to be a challenge. Can’t wait to see what you come up with.